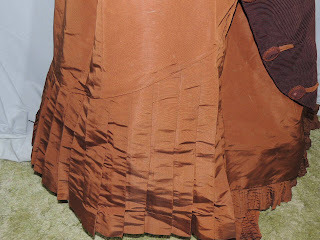 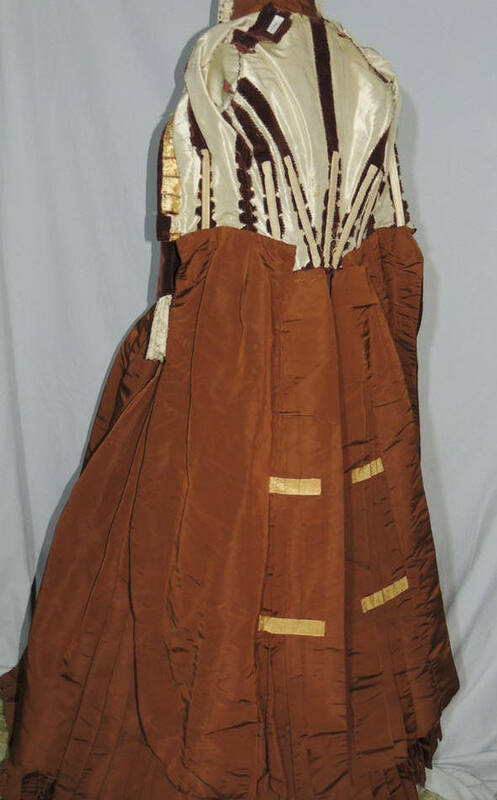 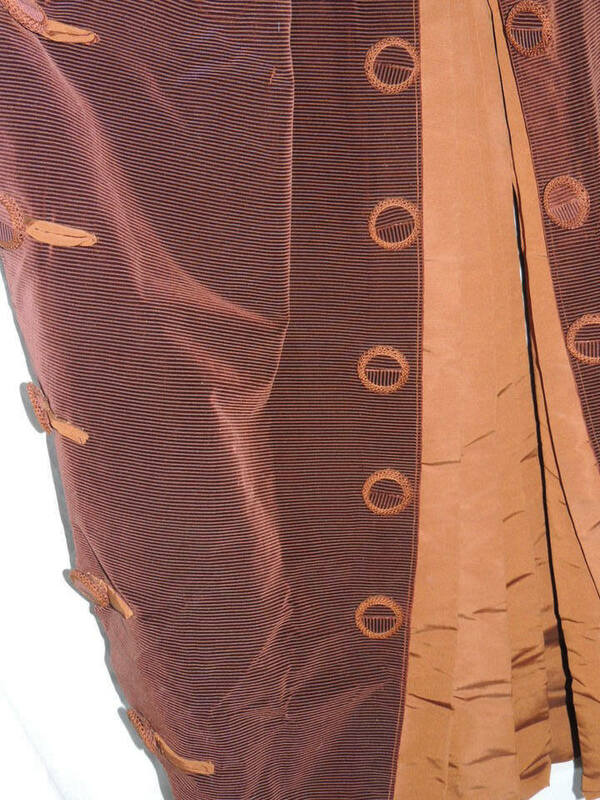 This beautiful Victorian bustle dress has a polonaise styled bustle bodice made from a rusty brown striped velvet. It has a lace collar and ruffles at the cuffs and great covered buttons that are crocheted around the edges. 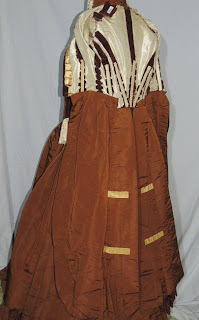 The bodice is boned and lined in silk, it has long panels coming from the sides, the center back is opened to the waist and has pleated silk taffeta that matches the skirt in the center back. The skirt is trimmed with the same interesting buttons on a larger scale. 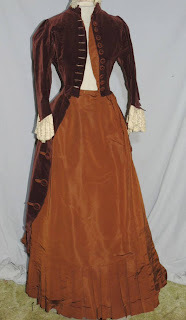 The bodice has a tear at the back of the neck, on the bottom of one sleeve and some small scattered tears/holes and a rubbed spot on the upper sleeve. 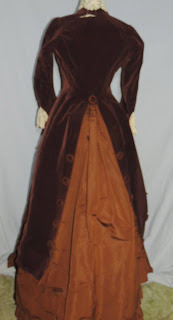 The buttonholes are faced with silk ribbon, the ribbon is shot, the lining is pretty good, a few small tears on the upper portion, but the acron colored silk on the skirt portion is fine. 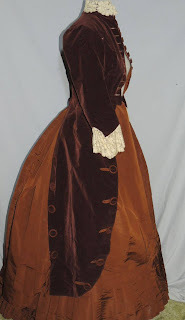 It comes with a little bag with some small scraps of fabric that you can use for restoration. The skirt skirt is smooth in front and full in back to allow a bustle, There's a pleated ruffle around the bottom that curves up higher on the sides and it has a narrow knife pleated ruffle attached underneath to the edge of the hem. There's a few very light, small spots on the skirt, needs a hook and eye, the narrow ruffle needs to be sewn on for about 4 feet, it's just hand stitched on and is comein loose. 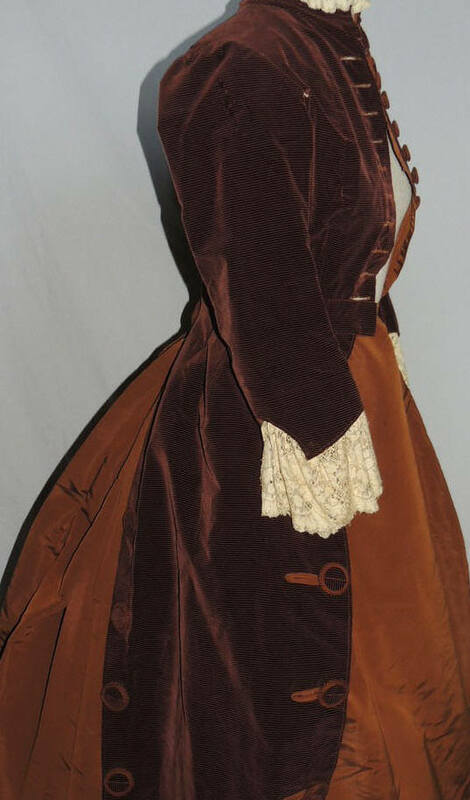 The bodice measures 34 iches around the bust, across the back shoulder is 12, waist is 22 and shoulder to waist in front is 16 1/2 inches. 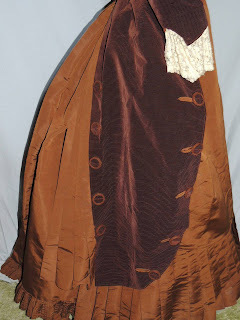 The skirt is 23 inches around the waist and is 39 1/4 inches long. 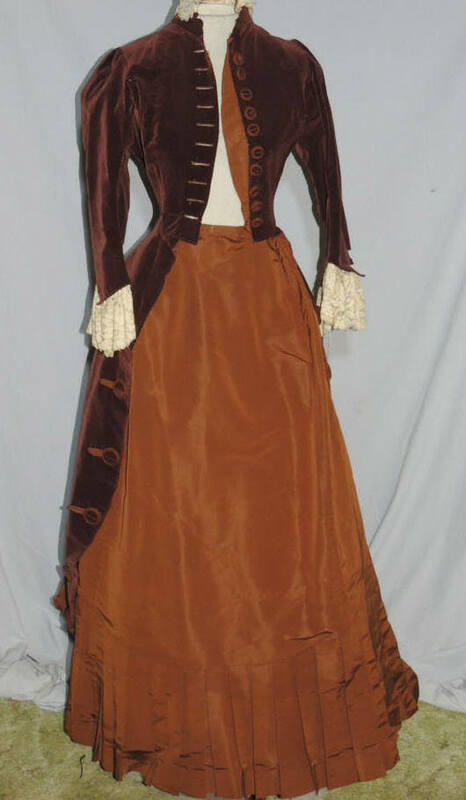 Good restorable condition. De-accessioned from a museum and inventory tags are attached. 1880's but early this time, at least.